7.33 points at 15 votes (rank 247). In PSI 5 Trading Company the player takes over the role of a captain of a space transporter with the task to bring urgently needed goods under time pressure to the target planet through a sector full of pirates. For this you are in permanent contact with the crew members from the different departments of the spaceship as e.g. the chief engineer or the navigator. You give them orders which they try to put into execution to the best of their abilities. Feedback from the crew keep you updated and - theoretically - enable you the react specifically in situations of crisis of which enough will arise in the game. "You all are so stupid...and I am your boss!" After having decided for one of three possible missions (=difficulty grade), you have to choose one of each six applicants for each position. You need a guy for the weapons, a scanner, a navigator, a chief engineer and a director of the repairs department. All in all there are 30 "persons" to choose from: sociopaths, nerds, freaks, aliens, robots and other lunatics. If you choose an applicant’s photograph, a dossier is shown that lists the special qualifications, strengths and weaknesses and other references. You should read those very carefully to be able to use the special abilities of the crew members correctly. So some candidates e.g. clearly outclass others in different areas, others on the other hand are e.g. telepathically talented, fragile or mumble, are (un)motivated, aggressive, rebellious or untalkative. Or the exact opposite. By this, every member of the crew has a kind of personality, which - paired with his abilities - influences the efficiency of the given tasks. Also the probability with which the routine tasks are done out of his own accord is influenced by the crew member's personality. 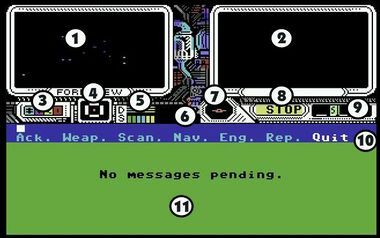 1: Look-out: Shows appearance and activities of approaching spaceships. 2: Screen for the intercom (9). 3: Status of the four weapon systems. From left to right: Missiles, Blaster, Cannons and Thermos. If a weapon is damaged, the corresponding display gets grey. A complete defect weapon is coloured in black. 4: Status of the four defence shields, that fend off the hostile shots. Intact shields get white, damaged ones red and defect ones are not displayed. The dot in the middle shows the loading status of the shield's battery. If it flashes, the shield's energy has fallen below 10%. If the dot disappears, the shield's load is used up and all shields are completely useless until the battery is reloaded. Destroyed shields or an empty battery automatically lead to damages on the spaceship if you are exposed to hostile shots. 5: Displays for energy usage (Demand) and actually supplied energy (Supply). If more energy than available is used, this will lead to limited utilizability or total outage of different systems as e.g. weapons or gears. Sexist biased message from the ugly spinster at the Scanner. 6: If the floating battery is activated, a corresponding display starts to flash here as soon as less than 10 seconds of emergency power are left. 7: Here the conducted changes of course are shown and whether the ship flies evasive manoeuvres. 8: Current speed of the ship. Goes from 0 ("Stop") to 8 ("Full"). (here "S" for SCAN). If several messages from one department are there, this is shown in a certain colour. Attached messages can be called up from every department of the ship with the command ?. As all incoming messages are put here until they are called up, you should watch out that there is no mass accumulation of messages in which you can easily lose the overview. 10: Navigation bar to contact the crew members. 11: Message display. Here the messages from the intercom are displayed. missiles, blaster, cannons and thermos. Each gunner has at least one weapon that he masters especially well, so e.g. Boris is well acquainted with the cannon and the missiles. If the transporter is attacked, you change to the department WEAP with the navigation bar where you can first choose a weapon type and then a target with the command Fire, whereby each enemy (but also amicable ships) are marked with a letter. Additionally you can tell the shooter, whether to use a limited number (1-9) of shots, or go on firing (at will) until the enemy is destroyed. The object was successfully aimed at ("lock" = yes). For this the tracking system (Track lock) must be undamaged. The enemy is within reach ("in range"). So this data first has to be collected from the scanner department. Only then can the enemy be shot at. How fast you can make a successful shot depends on the shooter's experience with the corresponding weapon and the type of enemy, of which some are especially sensitive or resistant against a certain weapon. A skilled shooter using the correct weapon needs a maximum of five shots for a "kill". When unfavourable combinations happen, you may be shooting for minutes at the same enemy without getting even the slightest effect. 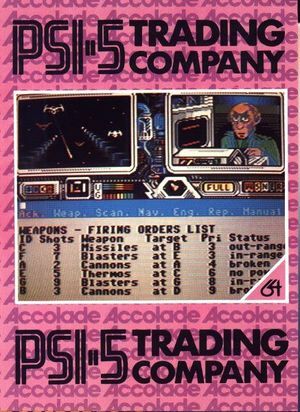 The information about which weapon is especially effective for which enemy can be received also from the Scanner. If you accidentally shoot an allied ship, this results in a massive deduction of points at the end of the game. Jaru targets a suspicious flying object ("B"). The Scanner is the eye of the weapon department. Without the Scanner's information the gunner cannot fend off any enemies. The procedure is the following: first you choose examine, whereupon you get presented a list of not registered objects. If this list is empty, there is no other spaceship within reach at the moment and you can care for other tasks for a short (!) time. New objects get a letter and are now automatically registered by the tracking system ("Track lock"). With Display you can now view a complete list of all registered spaceships that shows whether the spaceship is friendly ("frd") or hostile ("foe"), if it is already targeted (lock=yes) and if and where it is damaged ("Damage": Shields, Engines, Weapons). With this information you can now switch to the gunner and give shooting orders. With Status you get the same information shown in another view as well as an overview of the load's status. Depending on the length of the scan process and the abilities of the crew member, the identities of the flying objects and ideal defences are determined bit by bit. To not oversee any potential attackers, you should check the Scanner several times a minute. With Status you can get a list of all possible routes to the target planet, their distance and the risk to get attacked by pirates combined with them. The shorter the route, the higher the risk and the more pirates will attack you. However, also the clock will run down mercilessly and it takes you utmost effort to deliver the goods on time, if you choose a secure but longer route. Furthermore you are shown the relative and absolute arrival time, whereby you should make sure by all means that there is a negative value next to RETA, which means a presumable arrival on time at the target planet. When you have decided for a route, the desired course is chosen with Rank and the speed is set with Accel. You can still choose between normal drive and evasive manoeuvre, the last reduces the change to get hit in a fight, but has a negative effect on the speed. The navigator can only generate risk scores if the Info Scanner is functioning and receiving power. That is why risk scores typically disappear in flight. Getting a new risk reading may require engaging the emergency battery, changing power priorities, or significantly reducing speed. To save energy and reach the maximum flying speed, the chief engineer switches off the supply of the missile and thermo weapon systems before he puts the supply priority of the thrust at first place. Here it is controlled how much of the energy provided by the two reactors is given to the single departments of the ship. By either raising or lowering the priority of a department with the help of the Rank command, you can influence the performance. So e.g. the maximum speed can only be reached by either setting the priority of the engine up or respectively turn off the energy for other systems with the help of Cancel, e.g. for weapons which the gunner cannot handle according to the dossier. The disadvantage of the engine being at first place is, that it needs so much energy that other systems (e.g. weapons) can completely fail. So as long as you fly at the highest speed, you are defenceless. With Display you can view the full list of the priorities in supply of all departments. With Status you get a list of all sub-systems that can be switch on and off by Enable and Cancel, as well as the displays for shield and floating battery. It supplies the shields with energy and is used up by each hit by an enemy. When it is empty, the shields offers no protection, no matter whether they are intact or damaged. The shield battery automatically reloads with a rate of 1% per second if the ship is standing still or if you raise its priority. It can provide emergency power for up to 99 seconds. If it is activated with Enable, all departments get maximum power. So you can e.g. still fire all weapons despite the highest speed or substitute a failing reactor for a short time. To reload the once empty battery, it has to be disconnected first with Cancel. It reloads automatically, as soon as the ship stops or you raise its priority. Volfgank will soon bite into his soldering iron. As soon as the shields are either damaged or the load has sunk down to 0%, the hostile shots will damage random components in the ship. E.g. damaged engines reduce the maximum speed, while a hit on a reactor causes a drastic loss of energy. The same counts for weapons that can completely fail in the worst case. If this happens, the pirates seize the transporter and start to bring away the goods, which is shown by a corresponding message. So to avoid this happening, 7 repair robots ("Robodroids") are available that you can distribute to damaged components. With Status you can view the list of damages and with Assign you pick up to seven Robodroids for the repair job. The more, the faster does the work proceed. Or you divide the robots to be able to repair several damages at the same time. This is done by giving the same priority to the single teams while assigning or retrospectively over Rank. Repair robots can also get damaged, which slows down all further repairs until they have been restored by their colleagues. The game ends as soon as you have reached the target planet or lost all the goods. The goods can be lost by looters, damage of the freight hold or directly by shots from enemies. On longer missions there is also the peril that the goods start to go to seed after some time. When you arrive at the destination, a final evaluation informs about the occurred costs and the amount of the hopefully made profit. Added to this are bounty prizes for shot enemies and a considerable "early" bonus, if you have delivered the goods on time or better even earlier. The graphics are wonderfully detailed and have a great comic streak. There are, though, clear colour clashes, but the lovely done animation of the crew members compensates well for this. The hostile attacks on the other hand are displayed as tiny, detailless sprites. The buildup of the menus is clearly classified and well-arranged and needs only a short time of getting used to, at least in the third game you almost move instinctively and above all fast through all the stations. The sound is unfortunately only in two voices, the third voice serves for the explosion sounds and the acoustic signals. However, each department of the ship has its own signature tune, which starts as soon as you are at a place for more than a few seconds. They are though short rather snappy and inventive. The title melody blares virtually as in the movies and creates the perfect mood for the game. Further short loops play during choosing the crew, at the start and arrival at the destination or when pirates enter the ship. You notice that this is a professional's work. The crew member's messages were also done humorously. So you are covered with a great number of always getting worse evil tidings with gallows humor during the game, while the crew loses its poise one after the other. Here you read some real knee slappers that even cause you laugh during the biggest crisis. To get back fast from a sub-menu to the main navigation bar, press fire button and pull the stick down. The game can also be controlled with the keyboard. Just always press the first letter of the required command. The pause mode can be activated and ended with Run/Stop . During the fight against the pirates you should notice the sound effects. A deep, muffled rumbling from the explosion shows that an enemy was hit and you probably have chosen the correct weapon. A bright crashing and a tremble signals on the other hand, that you were hit. If you are a survivor you change the display of the messages to "auto" in the menu Ack. Incoming messages are then INSTANTLY displayed, which causes utter confusion and at least doubles the stress. On the other hand you avoid noticing an urgent message much too late by this. Front-, Starboard-, Port- and Aft-Shield: The four protective shields that are supposed to protect the ship from hostile shots. When they are damaged, they give only little protection, when broken no protection at all. Missile Sys, Blaster Sys, Cannon Sys, Thermo Sys: The four weapon systems. Damaged weapon systems need more energy. Engine 1&2: drive nozzles. When they are damaged, the maximum speed is reduced - in the worst case to a total stop. Port- and Starboardretro: control nozzles. Without the control nozzles the ship cannot fly any evasive manoeuvres or change the course. Cargo Stab and Cargo environment: Freight hold. Damages lead to a loss of the transported goods. Reactor 1&2: Reactors that produce energy for the ships departments. Damages lead to a reduced production of energy and with this an outage of all possible systems. Robodroid 1-7: The repair robots. The more of them are damaged the longer it will take to repair damages. Track Lock: Target lock system. If it is damaged, newly registered enemies cannot be shot at. Info Scanner: Sheds light on the type of attacker, appropriate defence weapons and the risk rating of the possible courses. Life Support: Life support systems. If they are damaged, the crew members run the risk of losing their life, depending on their physical shape. Firstly, this reduces the score and secondly it radically limits the options for actions of the now vacant department. Without a navigator no corrections on the course or evasive manoeuvres can be made. Without chief engineer you cannot set any priorities for the power supply. Cravenlator: A totally useless machine and the only component in the spaceship without any function. However, all chief engineers make a song and dance about it when it is damaged and even the repair department does care for it with high priority. This has to be seen as a Running Gag, because firstly the messages are also funny and secondly the bl**dy thing is really totally useless. Stay alert all the time. CONSTANTLY (!) check the Scanner with Examine and Display to quickly find potential attackers. To save energy, place the weapons that the gunner cannot handle in the machine room. If nothing (?) is going on at the moment you can let the shield battery reload by raising their priority. Watch if fired weapons have an effect (Displayin the Scanner or by acoustic signals = deep explosion sounds) and if needed choose another type of shot. If you are attacked, instruct the navigator to fly an evasive manoeuvre and make sure the required weapons have energy. As soon as the shield battery has sunk to 0%, stop immediately, give the shield battery the highest priority and first defeat all attackers before you continue on your course. This way you firstly avoid that further attackers appear and secondly make sure that the shield battery reloads. The following spaceships are always enemies, that can be shot without hesitation, although they themselves have not gotten aggressive yet: Zeltoads, Narviks, Kiffboks, Skronts, Lepsors, Flarkins and Xantogs. The following machines should always be repaired first: both Reactors, Track Lock, Cargo Environment and Cargo Stab. If the latter two are damaged the goods start to slowly dissolve. As the time is utterly limited, repair stops must only last as long as it takes until the critical machines work again. Damaged shields, control nozzles ("Retros"), Robodroids or unused weapons need to be repaired as best as possible during full drive. On the last meters to the destination you should use up the rest of the floating battery load to be able to fly with the highest speed. The life support systems for navigators or engineers, that have a mention of physical fragility in their dossier, should also be repaired as fast as possible. Dead crew members cause a reduction of points. Cheating does not really make much sense in this game as even the crackers from WiseGuy Industries 2015 admit in their "+" release from 2009 that offers a "pirates never hit" trainer. The game simply becomes too boring by using that one. Robotron2084: "PSI 5 is a perfect crisis management game in comic style. As soon as you are quasi overrun by the first bigger wave of pirates, the planning instantly ends in smoke and an unbelievable chaos arises. Message about damages come thick and fast and make a purposeful and sensible acting only possible with utterly concentration. Unfortunately, such a situation can literally arise out of nothing at any time, if you are heedless for only one minute and e.g. forget to check the Scanner. Or when you have overseen, that the target lock system or the reactors are damaged since quite a while. 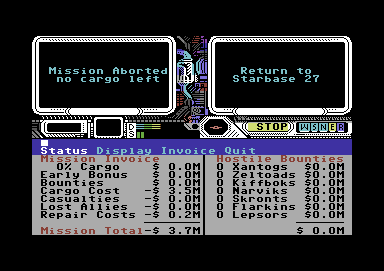 Then the game can tip over very fast and suddenly you are with a plundered wreckage of a transporter, staring at the negative final evaluation. What is more is, that the processes in the game repeat themselves and sometime you know all comment of all crew members by heart. But until you are that far, you need to play a few dozen games during which you can neither stop laughing or clamouring with rage in turns. Nice that there is a game on the C64 with such a high complexity. 8 out of 10 points." Rockford: "I have never understood PSI 5 in the old days, but I always guessed that there is a good game behind it. I simply assume that this great article will get me further a decisive step in the game. Voting and edited critics will be done, when I have played the game a bit." The +FMD-101% version by Mayday! from 2019 is based on an NTSC original with the additional rookie mission "Renlozen". KERNAL based disk operations, so it runs fine with Jiffy-DOS and SD2IEC or in emulators such as WinVICE with settings True Drive OFF and Virtual Device traps ON, even Cartridges such as Retro Replay or Final Cartridge III work. "Fast Docs" consisting of most important tips for getting started. The demo mode did not fit on the 1-disk-version and was replaced by only leafing through the characters when you do nothing in the Select Course/Crew part. The +FD EasyFlash version by Mayday! from 2019 is based on the same original. The + Version by WiseGuy Industries from 2009 was cracked from tape. shorter loading than in original disk version, should also run with Jiffy-DOS on an SD2IEC or in emulators with True Drive OFF/Virtual Device traps ON. The additional planet "Renlozen" from the 4 missions version is an anagram of developer Lorenzen. Ed Bogas, who has written the background music for the game, is a music componist specialized on animated cartoons. Some of his references are "Fritz the Cat" and "Heavy Traffic". He was member of the Progrock band "The United States of America". fan page on which the crew messages can be found. This page was last modified on 9 April 2019, at 07:30.